Note: We each ate our own SMALL head of Cauliflower. I served this with Lamb Rib Chops…very simple dinner, but a VERY fancy presentation and very tasty! Preheat oven to 475°. Bring wine, oil, kosher salt, juice, butter, red pepper flakes, sugar, bay leaf, and 8 cups water to a boil in a large pot. Add cauliflower, reduce heat, and simmer, turning occasionally, until a knife easily inserts into center, 15-20 minutes. Using 2 slotted spoons or a mesh spider, transfer cauliflower to a rimmed baking sheet, draining well. Roast, rotating sheet halfway through, until brown all over, 30-40 minutes. 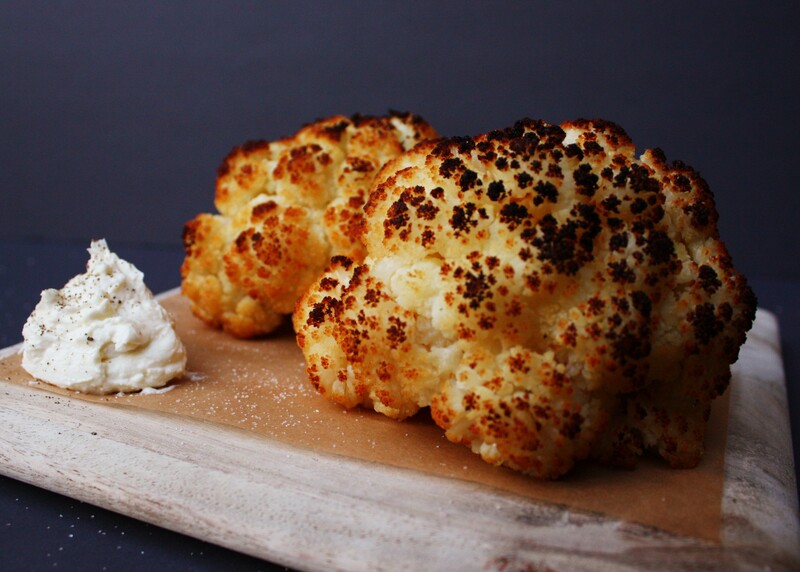 While cauliflower is roasting, blend goat cheese, cream cheese, feta, cream, and 2 tablespoons oil in a food processor until smooth; season with sea salt. Transfer whipped goat cheese to a serving bowl and drizzle with oil. Transfer cauliflower to a plate. Drizzle with oil; sprinkle with sea salt. Serve with whipped goat cheese. This entry was posted in Main Dish, Sides & Snacks and tagged cauliflower, cheese, clean eats, goat cheese, Healthy, Organic, real food, roasted, veggies, vegitarian. Bookmark the permalink. ← Just because your Burger has no bun…doesn’t mean it’s Boring!